Left Hand Drive: UK Registered: only 13,866 miles from new. 1 of only 47 produced with original European specification. Previous long term ownership of 26 years. Nothing can quite prepare you for the first time you come across a V8 Volante! Stunning from every angle, they represent the pinnacle of decades of hand-assembled Aston Martin production. True craftsmanship shows itself in every detail and the stunning combination of beauty, luxury and power is as rare today as it was when this car first saw the light of day. With the introduction of the Aston Martin’s Volante this model propelled Newport Pagnell back into the supercar league of the manufactures whom produced the best convertibles namely Rolls-Royce & Bentley. 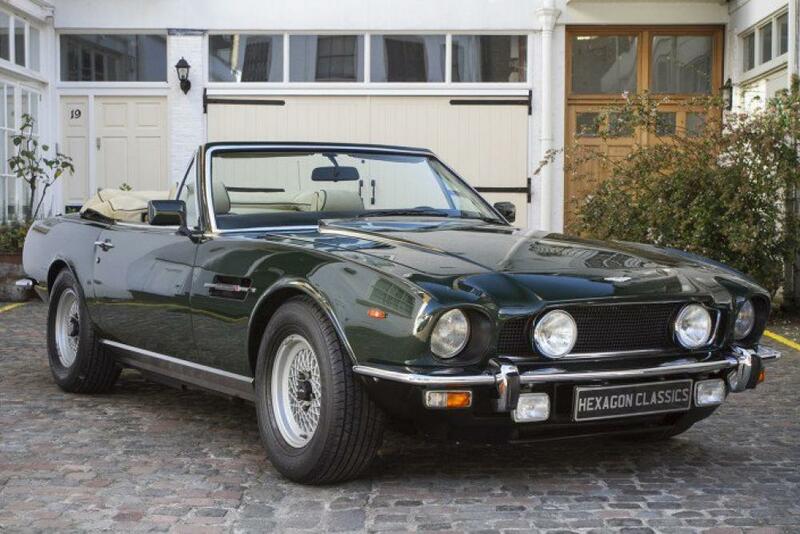 This particular original European factory built specification V8 Volante with the desirable automatic transmission, was delivered new on the 18th June 1986 by Aston Martin Sales, London SW1 to Mr O Otham. The second and last owner acquired the V8 Volante on the 25th March 1988 and kept the motorcar until October 2014, thus long term ownership of some 26 years! Aston Martin Racing Green & fitted with a Green Everflex Hood, Beige Connolly Hide Interior & beige Wilton carpeting. The car has its original and complete Handbook Wallet Pack & a documented service history from new and factory fitted luggage (3 Pieces). Our post sales preparations will include a new MOT and all safety checks will be completed by an official Aston Martin Heritage Service Centre prior to handover. Our European Specification Aston Martin V8 Volante should not be confused with re – imported USA converted vehicles & is one of only forty seven cars ever produced by Newport Pagnell to this configuration. Left hand drive V8 Volante’s rarely become available for sale, & with only 13,866 miles & having had merely two recorded keepers from new, this is surely a unique opportunity to acquire an ultra-low mileage Aston Martin V8 convertible.